BITTERROOT VALLEY, Mont. - Remember that scene from Dances with Wolves, when Kevin Costner's character spins through billowing, thigh-deep yellow grassland, his fingers lightly grazing the seedheads? I've spent a good stretch of this radiant summer morning working across a prairie in Montana's Bitterroot Valley doing the same thing, but without that inspiring light touch. I've been ripping off the seedheads wholesale from their ripe-waving stems, one fistful after another, collecting rough fescue, bluebunch wheat grass, needle and thread, and some species of three-awn I've yet to identify. Of course, this isn't just any landscape, it's my own 25 acres of Northern Rocky Mountains, where I've been serving as temporary caretaker, and which has taken possession of me for nearly a decade. I've always liked the county inspector's terse, official description when I applied for a septic permit I never used: "Way up on the back side of Three-Mile. High upland, sagebrush and pine vegetation. Dryland site." That's me, for sure, and all deliberately. My family's history is Louisianian, but I came to Montana after 15 years in the Southwest. Looking for Montana property, I kept getting Realtors who wanted to show me these green, gloomy places they said their customers from Michigan and Minnesota just loved. In exasperation, I finally almost shouted at one: "Just take me where the goddamned sagebrush grows!" The result of my bias for open, sagey, sunlit country is that I now live where the only previous long-term inhabitants were the Bitterroot Salish Indians, more than a century back. Technology has helped. Today, the modern homesteader equivalents of the windmills, barbed wire, and sod houses that made 19th century settlement on the Great Plains possible consist of things like solar panels, wind turbines, composting toilets, cell phones, and satellite dishes. It's a kind of liberation we lost with early 20th century electrification, when we got used to living only where the power grid could reach. Now the self-sufficient house, nestled into the landscape like an Indian campsite, generating all its own power for modern functioning, is capable of letting us - in Gary Snyder's phrase - reinhabit America. At the same time, inhabiting a place like my Montana parcel demands a specific responsibility: ecological restoration in an attempt to bring back this part of the West to the state of rich biological diversity once enjoyed at the hands of those previous long-term inhabitants. But, in order to know how far back I should model this resurrection, I needed some knowledge of what evolution and the Indians shaped. Because, however much the idea appalls those who think of humans as somehow "not natural" and best confined to cities where someone can keep an eye on us, we have a responsibility to the New West that begs thoughtfulness of both its human history and ecology, and the inextricable link between the two. So what I've undertaken isn't exactly a pure ecological restoration, but a creation of an entirely new prairie - a sort of cultural landscape. I like to tell visitors that the great Columbia River flows past my back door. In reality, the draw that snakes past my house, 100 feet away in a pine-canopied valley, is an end twig of a hydrological dendriform that eventually reaches the Pacific Ocean. It doesn't come bouncing and dancing out of the nearby Sapphire Mountains, but actually commences on my property. The name Dry Gulch belies its character. Once a year, during snowmelt, it flows water, which my partner and I can hear from the house, as it gurgles along. In my imagination, I've often followed this seasonal flow of water. I start at the snowbanks against the house, as it trickles down the dryland draw some five miles, where, 1,000 feet down, it spills into the Bitterroot River. Joining the Bitterroot's clear, blackish, salmonless waters, my snowmelt bounces along white gravel banks for a few miles, carrying a couple thousand trout, and, if an elk or deer doesn't lap it up, west of Missoula it joins the mallard-green rush of the Clark Fork. Once or twice I've chased after it from there, wallowed on a rubber raft through Tumbleweed and Fang rapids, past lavender spires in the Clark Fork's Alberton Gorge, looking for my Dry Gulch water as it arrows toward the Idaho lakes and, eventually, the Columbia and the Pacific. In the years since I bought my piece of "raw ground" Montana space, back in 1993, I've tried to reconstruct its history. Geologically, it was easy: As a result of the rainshadow cast by the towering Bitterroots, the eastern two-thirds of the valley has probably been a prairie grassland for several thousand years. Since Glacial Lake Missoula drained and the climate warmed at the end of the Pleistocene, sagebrush has scattered across the foothills. But the prairie here is unusual. Its dominant species are all bunchgrasses, rather than the rhizomatic species that are found east of the Rockies. In this the Bitterroot Valley prairies are like the Palouse Prairie to the west, and some ecologists actually do call the prairies of western Montana - or what's left of them - "Palouse." In fact, these Intermountain valley prairies are unique. Back when Lewis and Clark first glimpsed it in the fall of 1805, they delighted in the Bitterroot's "pleasant plains," thick with grass and "wild hyssop," the biblical term they used for sagebrush. On Sept. 9, 1805, following the open country along the east side of the Bitterroot River, the explorers crossed a small creek that may well have been Dry Gulch, then sat down to lunch about three miles below where my house now stands. 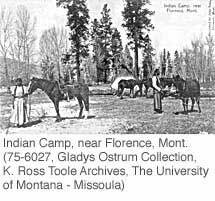 It wasn't long, though, before the Old Montanans - who inherited a slightly used land from the Indians - pretty much made a mess of the place in record time. A century ago, just a couple-hundred thousand Old Montanans tore up the hills and ruined long stretches of the rivers. Pioneer loggers built railroads up most of the drainages in these foothills, clearing out the old-growth ponderosas. Chinese miners who came through in a flurry, hoping for a strike, left dug-up and disturbed ground just over my fenceline. In the 1920s, across a good deal of the valley, the Great Apple Ranchette boom (and bust) left its imprint. By the 1930s one of Montana's governors stocked the ridge above me with cattle. I still find stock tanks in the draw, and linear drain ditches are etched into the land. In the process, we de-buffaloed, de-wolfed, and almost de-grizzlied the state. And while a few Montanans whom history will remember - the Mike Mansfields, Lee Metcalfs, A.B. Guthries, Pat Williamses - heroically saved some big, charismatic parts of Montana, other Montanans fought them tooth-and-nail, which history will also record. At untutored first glance, the Bitterroot still looks like paradise. But what the Old Montanans bequeathed to me, personally, is ground that has been logged, mined, plowed, overgrazed, and over-run with weeds. When I bought my little rancheria in the early 1990s, half my place was covered by an exotic grass from Asia, growing up in dog-hair pine and fir, and the other half buried beneath a knapweed jungle. There was household garbage (and the carcasses of a hog and a stripped VW bug) in the draw. Elk from the nearby Three-Mile State Wildlife Management Area came down in the winter, although with little but knapweed to eat, they rarely visited my place. Yet beneath a century's detritus - I knew this instinctively and from what I read - lay all the contours of that beautiful world that evolution and the Salish had made here. But how could I, alone, bring back that world? Most restoration, after all, has to be a community decision. I can do all in my power to make sure I get more chances to sit by a fire in my yard and hear wolves howl, or to watch black bears roily with autumn fat wallow out of the creek bottom, or to backpack into the Bitterroots with grizzlies padding through the canyons, but I can't, acting alone, really affect their populations. But, I discovered that I can affect the numbers of elk bugling across the autumn foothills around my house, and coax my prairies to come to life as "a fairyland of flowers" as Montana naturalist Morton Elrod described them in 1904. Which brings me back to all those grasses waving their seedheads on a heavenly morning last July. The dominant, native rough fescue in my prairie is called "buffalo bunchgrass," but it's a misnomer. Intermountain prairies were only seasonally good forage for buffalo, or for any big ungulates that ranged in very large herds. All the grasses of this prairie are cool-season species, which green up early, set seed early, and go dormant by early summer. Buffalo preferred warm-season plains grasses like grama and true plains buffalo grass because they remained green and held their nutrition throughout the year. Deer and elk did splendidly in these prairies even though bison found them too dry. But the bunchgrasses, and the Bitterroot's mild winter climate, were especially ideal for horses. Some 2,000-3,000 years ago the Salish arrived, and expanded the prairies by deliberately setting fires in the foothill/ponderosa zone to encourage the growth of grasses. While sagebrush, rabbitbrush, and Douglas firs decreased across the landscape, bunchgrasses thrived, along with giant, scattered, yellow-belly ponderosas. Sometime in the 1700s, the Salish acquired horses through the Ute/Shoshone trade network, straight up from New Mexico (subsequently employing Spanish tack and gelding technique). By the time Lewis and Clark arrived here, the Bitterroot was already known, as it still is today, as "horse valley." Everyone who saw this Indian-managed Bitterroot Valley was over-the-top impressed. When the Isaac Stevens Pacific Railroad Survey confronted the Bitterroot Valley, sometime in the mid-19th century, one of its members - John Mullan - wrote admiringly of the waving "luxuriant grass" and its grazers, scarcely noticeable in the vast expanse. In 1857, John Owen, whose adobe post was then located just below where my partner and I now live, figured the Salish had 4,000 horses, or about 10 per person. Based on the figures compiled by my friend, Duke Richey, in this arid climate even that small number would have needed 100,000 acres of the valley's grasslands. And those grasslands would have needed replenishing, which the Salish continued to effect with regular firing. But so vast were the Bitterroot prairies of two centuries ago, and so few the Salish and their horses, that the animals didn't transform the place much. It was when cattle moved in that things started changing. Early Jesuit missionaries and traders, founding Euroamerican Montana in the 1840s, settled in the hills in the valley just below me. Not long thereafter, in Three-Mile Valley, just a mile to the south of me, a Kentuckian named M.E. Harris began running European livestock. 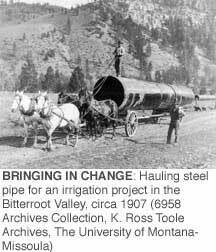 By the 1930s there were 50,000 cattle and sheep in the Bitterroot, and they dramatically changed the valley's ecology. Eventually, a mile east of where I am now, the Brown Valley Ranch sold the state the first parcel of what is now the Three-Mile State Wildlife Management Area, set up for winter elk range and "compatible recreational opportunities for the public," ending a century of wildly abusive grazing. Today, most people see this prehistory as an innocuous prelude to the current real estate boom. I think they've misread the past. The 1840-1980 history was no prelude, it was the transformation itself. The sagey bunchgrass prairies at the head of the Columbia River, evolving for 14,000 years, were ruined long before any of the subdividers or rancheteers ever got here. As I see it, my responsibility to the Bitterroot, to its awesome beauty and heart-breaking history, is to try to restore it. And that means dealing with weeds. Weed invasion, whose lowly origins date back to the 1920s and follow with mounting voraciousness all the overgrazing and other disturbances, is the real crisis in the Intermountain West. During the 1960s and '70s, dryland farmers on the Sapphire side of the valley gave up on their wheatfields and planted exotic Asiatic wheat grasses for stock, or sold their ground for subdividing. In 1978, mine became the most easterly parcel of about 65 similar-sized ones in a big high-prairie subdivision. To date, fewer than a dozen parcels have been built on (turned out there's almost no underground water up here). About half my 25 acres went through the wheat field-to-wheat grass process; the draw itself and about a dozen acres of bunchgrass prairie astraddle it were saved from that fate by being unworthy. Inevitably, the Bitterroot became ground zero for the original outbreak of spotted knapweed, which, along with other exotics such as toadflax, leafy spurge and cheat grass, has launched a takeover that's right out of science fiction. The Day of the Trifids. From the perspective of human landscape aesthetics, knapweed is a friggin' horror. It's a perennial, so a few seasons produce a knee-high jungle of wiry skeletons that rasp the legs and color the hills monotone dead brown, even during greenup. Knapweed doesn't go away, and every disturbance - a fire, a dry year, a passing cow, a road - spreads it. Like a viral infection, it has devastated the hills where once there were "seas of bunch grass" and a "fairyland of wildflowers." With the poison it excretes and its thirst for water, knapweed is capable of eliminating a third of the native forbs in an upland prairie in just three years. Knapweed spread from 4.5 million acres in Montana in 1989 to nearly 12 million acres by the middle 1990s. Winter forage for elk and deer, we can surmise, decreased by the same amount. On my little piece of Montana I've tried to go slow and be practical. I've let my horses have the Asiatic wheatgrass, I've thinned the pines and firs, and I've hauled off the junk. But, primarily, I've declared war on knapweed, and in this holy crusade I've used every conceivable weapon. I've mowed it, burned it, slingbladed it. When the ground is wet, I pull it up. 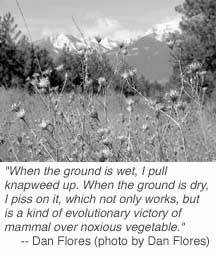 When the ground is dry, I piss on it, which not only works, but is a kind of evolutionary victory of mammal over noxious vegetable. But I've also done what I never thought I'd do: With rubber gloves and goggles and a backpack sprayer full of the mildest herbicide I can find - diluted to spare the sagebrush - I've sprayed one section after another along my draw every spring for four years now. Is this a restoration of the Salish/Lewis and Clark Bitterroot? Well, not quite. The ankle-high fescues, the clumps of waving bluebunch wheat grass, the needle and thread were still there, strangled beneath the knapweed. And now they're back in thick profusion on north-facing slopes, which is where I've been doing my seed harvesting for sowing on south-facing slopes where the native prairie didn\'t hang on as well. But, I admit, while the grasses and more slowly the hanging bells, shooting stars, balsamroots, paintbrushes, kittentails, lupines, and tansy asters, are all recovering, there are also patches of cheat grass and Asiatic wheat grass in this new native prairie. There's representation of nearly everyone who set foot here. So in a way I have joined all those other humans who have stirred the world and enriched it ecologically. Among them I count the Spaniards, who returned horses to the continent of their evolution, and the present-day visionaries who are helping to re-establish wolves, grizzlies, ferrets, swift foxes, mountain plovers and prairie dogs. It gives me immense, inspired pleasure to walk through this restored prairie, pleasure beyond whatever aesthetic satisfaction I may take in my world. Here's what I mean: Last winter, one late February afternoon as I skied eastward toward the Sapphire Mountains, I found myself nearly in the middle of a herd of some 80 elk bedded down a few hundred yards from my house. The next morning, still under the power of the previous day's experience, I woke believing I had dreamed of elk. Rattling around in my head were those odd grunts they make to one another as they travel, and the sound of rail fences rattling as they cross them. I got dressed and walked out of the house and along the footpath trails winding through my place. There was a little bit of new snow, and within 100 feet of the house I began to find elk tracks and droppings. Within a few minutes, I realized with a shock that, as I'd slept, my house had been enveloped by the whole Three-Mile elk herd that I had seen the day before. When I got to the other side of Dry Gulch, I realized why. The elk had spent most of the night pawing through the snow to get at all those native grasses, finally greening up - as had happened so many times in the past in the foothills at the head of the Columbia. Dan Flores is the A.B. Hammond Professor of History at the University of Montana, Missoula. He lives on a ranchette against the Sapphire Range in the Bitterroot Valley. Portions of this essay have appeared in The River We Carry With Us (2002), edited by Tracy Stone-Manning and Emily Miller, and The Natural West, by Dan Flores (2001).